presence in the world thru blogging on the internet. 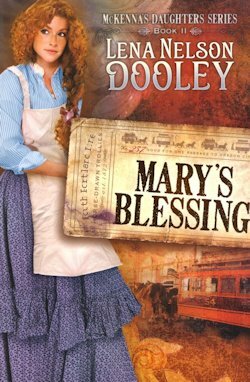 "Pa?” Mary Lenor a Murray shouted back over her shoulder as she picked up the heavy picnic basket. “You ready to go?” Why does he always drag his feet when we’re going to church? Her father came through the mud room into the kitchen, letting the screen door slam shut behind him. He smelled of heat, hay, and sunshine, with the strong tang of muck from the barn mingled in. By the looks of his clothes, attending church was the farthest thing from his mind. His ratty trousers held smudges of several dark colors. She didn’t even want to guess what they were. And the long sleeves of his undershirt, the only thing covering his torso, were shoved above his elbows. Grayed and dingy, the shirt would never be white again, no matter how hard she tried to get it clean. Mary bit her tongue to keep from scolding him as she did her younger brothers and sister when they made such a racket entering the house. No doubt he would give her some excuse about having too much work to go to church. Not a big surprise. She’d heard it all before too many times. He set a bucket of fresh water beside the dry sink and gripped his fingers around the front straps of his suspenders. That always signaled he was about to tell her something she didn’t want to hear. “I’m not going today.” This time he didn’t really make any excuses, just this bald-faced comment. She took a deep breath and let it out slowly, trying to calm her anger. She’d give him a sweet answer even if the words tasted bitter in her mouth. “The new pastor is coming today. We’re having dinner on the grounds after the service. Remember, I told you when we got home last Sunday.” She flashed what she hoped was a warm smile at him and prayed he couldn’t tell it was fake. Mary couldn’t keep from huffing out a breath this time. “I told you about that too.” She clamped her lips closed before she asked the question that often bounced around her mind. Why don’t you ever listen to me? At seventeen she was close enough to being an adult to be treated like one, and she’d carried the load of a woman in this household for years. Mary had never known her own grandparents, none of them. Not her mother’s parents. Not her father’s parents. Not the par- ents of whoever gave birth to her. She didn’t wonder about any of them very often, but today her heart longed for someone who really loved her. With bright red curly hair and fair skin that freckled more every time she stepped into the sunlight, she didn’t resemble anyone in this family that had adopted her as an infant. Since they were black Irish, they all had dark hair and striking blue eyes, not like her murky green ones. And none of them had ever wanted to know what she thought about anything—except her mother. No, you won’t. Mary had heard his statement often enough to know he was trying to placate her so she would leave him alone. So she would. Her father’s icy blue eyes pierced her. “Pretty warm out today. “We’ll be picnicking in the field between the church and Willamette Falls. It’s cooler there, especially under the trees with the breeze blowing across the water.” She started toward the front door. She nodded but didn’t answer or look back at him. All he cared about were those boys and getting them raised old enough to really help with the farming. He already worked them harder than any of the neighbors did their sons who were the same ages. Six long years ago her mother and older sisters contracted diphtheria when they went to help Aunt Miriam and Uncle Leland settle in their house on a farm about five miles from theirs. On the trip to Oregon one of them had contracted the dread disease and didn’t know it until after they arrived. No one knew they were all dead until Pa went looking for Ma, Carrie, and Annette a couple of days later. He saw the quarantine sign someone nailed to a fence post and didn’t go closer until he had help. When he came home, he told Mary she would have to take over the keeping of the house. Six long years ago. When did my life become such drudgery? Had it ever been any- thing else? At least not since Ma died, which seemed like an eternity ago.